Mythical Voltage was pleased to animate the music video for this track from James Irwin's album Shabbytown. Thanks to Duff Smith for editing and Sarah Pupo for contributing artwork. Prizma is available now for Mac, PC and Android devices. Prizma is series of meditative puzzles exploring colour and shape. RAI is Coming To the curious cabinets exhibit june 9th! Rai is a series of puzzles in which the player creates intricate lattice structures and colourful patterns while navigating increasingly complex frameworks. It's being included in the Curious Cabinets Exhibition put on by the Hand-Eye Society, where it will be retrofit into an old arcade cabinet. The exhibit will be on for a month at Electric Perfume, and Launches July 9th. More info here. Chrome pistol with a marble handle. This was developed for a first year Lab at George Brown's Game Development program. 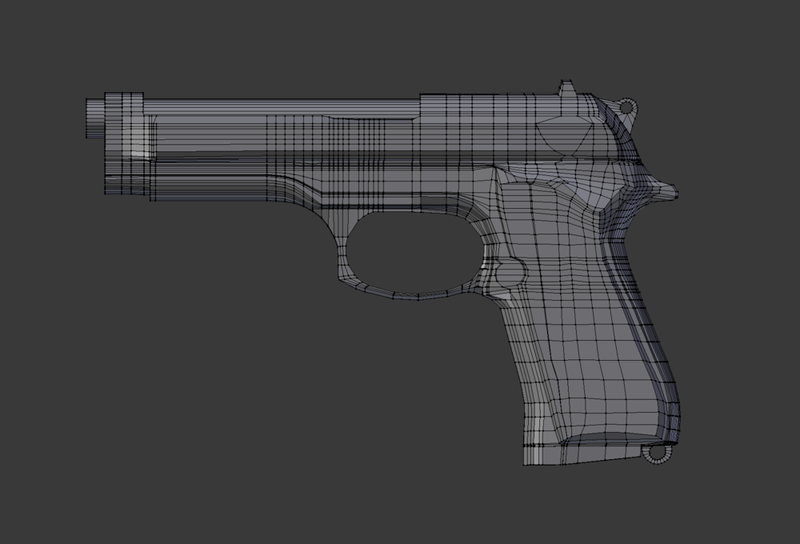 Developed for my first year modelling class at George Brown's Game Development program, these images show the topology I created for a Beretta handgun. This is a music video I made for Toronto musician James Irwin. I produced all the models and animations used in the video. is a small game development company based in Toronto, Ontario.